It’s the end of the day and your class is restless. Your students are tired of the same old brain breaks. The dismissal stampede starts in 10 minutes and you need stability and calm. You started your day with a smooth routine and paperless morning meeting–why not end it with a meeting too? Paperless afternoon meetings are a tool that will smooth your end of the day routine and enrich your classroom community. Chaos in the 3:00 hour is a nationwide problem, and I am here to help! What is an afternoon meeting? The paperless afternoon meeting is like morning meeting’s very wise older brother. Instead of greeting each other and preparing for the day ahead, students end their day with a time to reflect, appreciate, celebrate, and learn from the day’s events. Afternoon meeting is also an excellent way to encourage a calm, smooth dismissal. One of the best parts? It’s paperless: all you need is your whiteboard! What does an afternoon meeting look like? 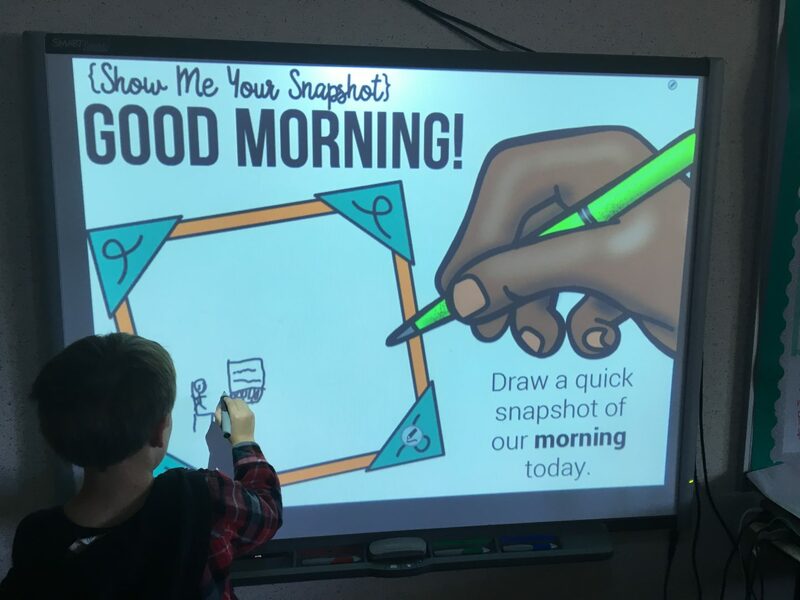 To begin, a student will sketch one part of the day: lunch, recess, or any other part of the day that is shown on the screen prompt. 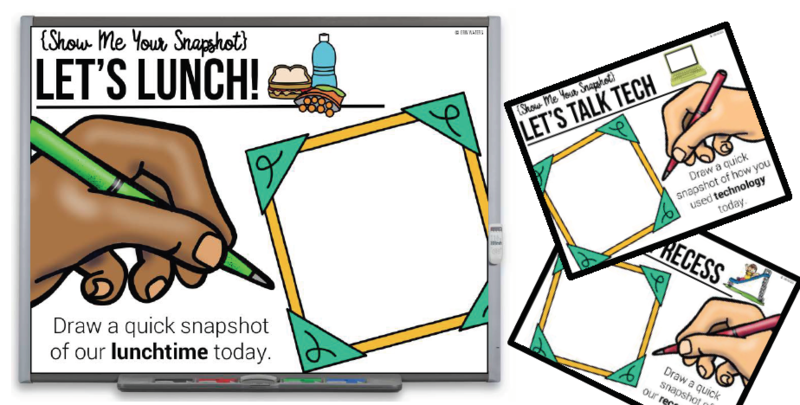 There are 10 snapshot themes in addition to an editable template you can customize to fit your classroom. 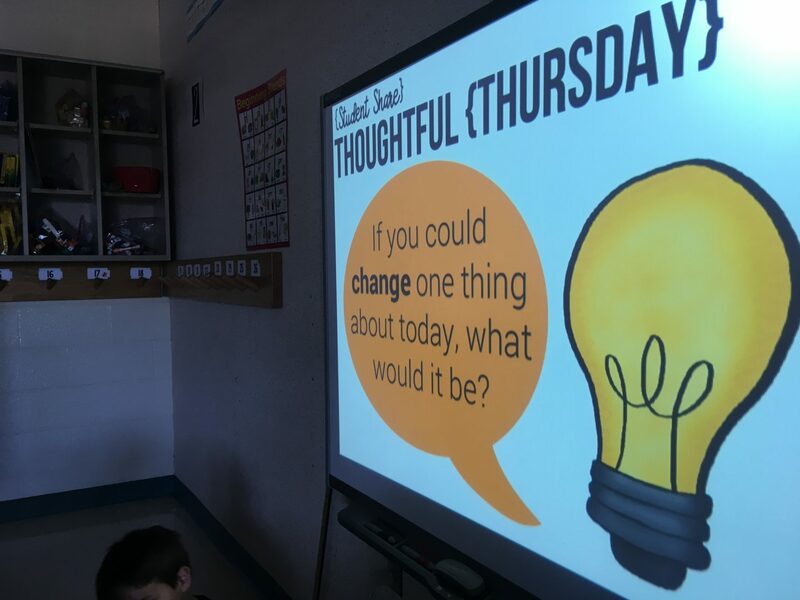 Student share slides follow a daily theme. 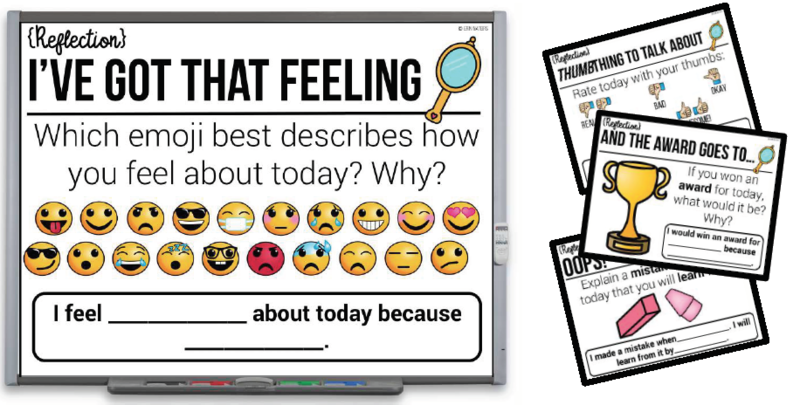 For example, on “Make It Count Monday”, students share their Top 5 moments from the day using their fingers to count them.You will choose a few students to share their reflection and response to the on-screen prompt. There are 30 different share slide themes as well as your very own editable version. 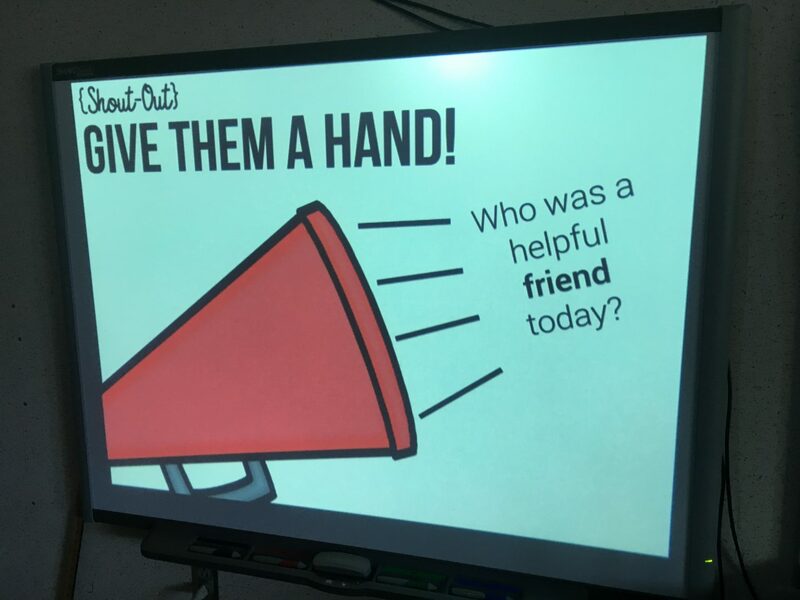 Student Shout-Out lets students recognize, thank, and appreciate other students in the class as they reflect on the good deeds of their peers. On-screen prompts follow 10 variations. You can even use an editable slide to create your own fun shout-out! 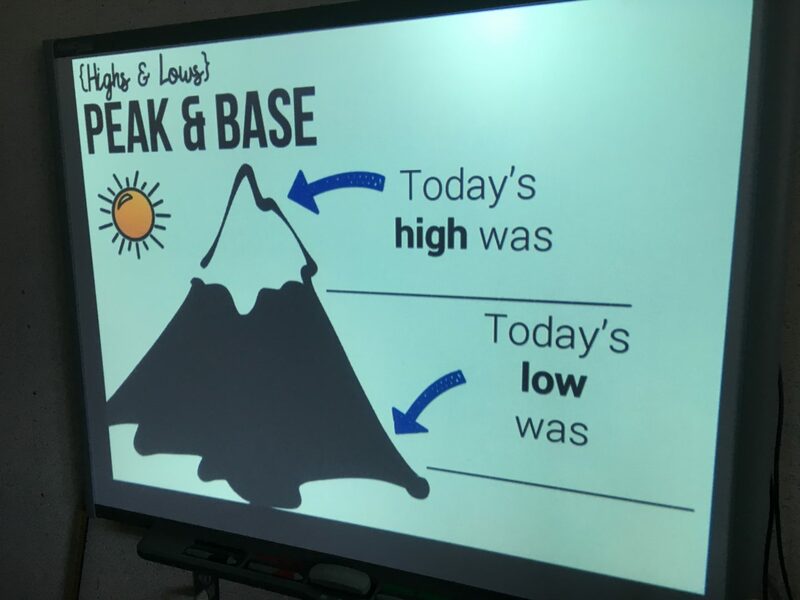 The Highs and Lows portion of the afternoon meeting provides students an opportunity to reflect on the good and bad parts of the day. Good times are celebrated and bad times are used to plan for a better day tomorrow. 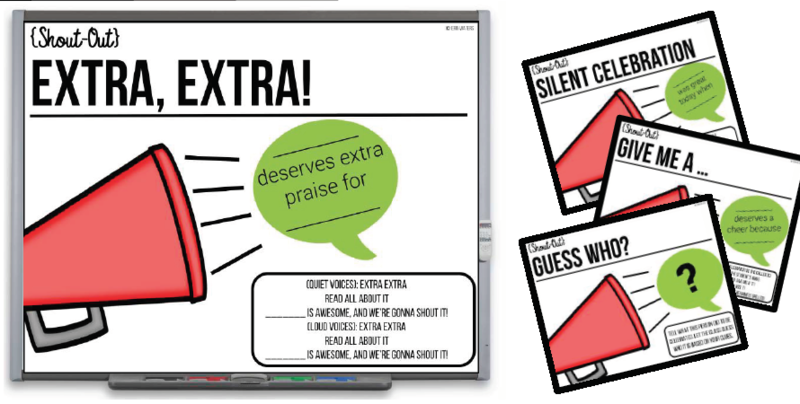 5 templates are offered, using themes like “Hot and Cold” and “Sweet and Sour.” As always, an editable version is included! The reflection portion of afternoon meeting is exactly that: a time to reflect. Students will view a variety of reflection slides over the course of the year-10 themes plus an editable option is available! Saying good-bye is never easy, but with these clever salutations, your afternoon meeting will wrap up in an enjoyable, seamless manner. 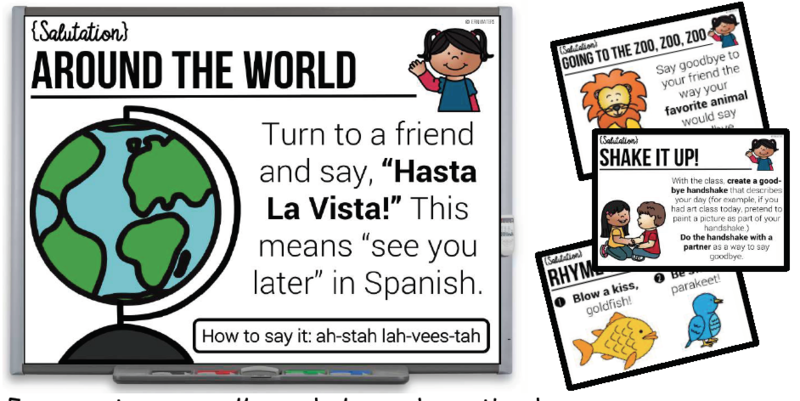 There are 21 salutation slides, including fun rhymes like “Blow a kiss, goldfish!” Students will also learn to say goodbye in different languages. Use the editable salutation slide for more flexibility! Are you ready to implement your very own afternoon meeting? You can try it out for a week to see if it’s for you (spoiler alert: it is!). To get it all and get your afternoons back NOW, click here!